They say a rat always knows when he’s in with weasels. So goes the line in the Tom Waits song A Little Drop of Poison. I don’t know if the song does or does not have anything to do with how this game came to be, but that’s what has run through my head since the first time I saw it sitting on the shelf of my FLGS. 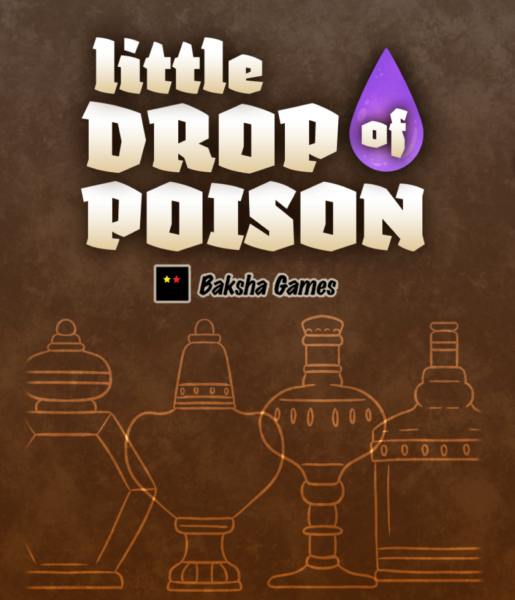 Little Drop of Poison, from Baksha Games, is a fun and easy little card game for 3-8 players. The set up is simple: randomly reveal one of the two kings (the Rat King or the Weasel King), then every player is dealt one of two peasant cards (a Rat Peasant or a Weasel Peasant). Players then play one or more poison or antidote cards face down on a player or the king. When the cards are revealed, varying points are earned for killing your opponents and the king. If the king survives, more cards are dealt out to any surviving players and another poison round happens. When the king is dead, everything gets reshuffled and play starts again with a new King and new Peasants until someone gets to ten points. This game is incredibly easy to learn, which is one of the reasons my group of players chose it. We had already had a few hours of heavy brain stuff and this was a nice change of pace. It is not hard to follow and still a great time. The art for the game is simple and effective. The Kings and Peasants are distinctive and appropriately cute. The poison and antidote cards are beautifully illustrated, with the poison cards having no hard linework and the antidotes having just enough to pop out as different. Depending on your group of players this could be a fast(ish) pallet cleanser between heavier games, or the main game for a night of light entertainment. I see this game sticking around as one of my go-to games for some time to come.